I had the distinct pleasure of being asked to create an image for my alma mater’s Christmas card from the President this year. Hastings College has been doing a lot of renovations around the campus, including the interior of the Taylor Hall dormitory. 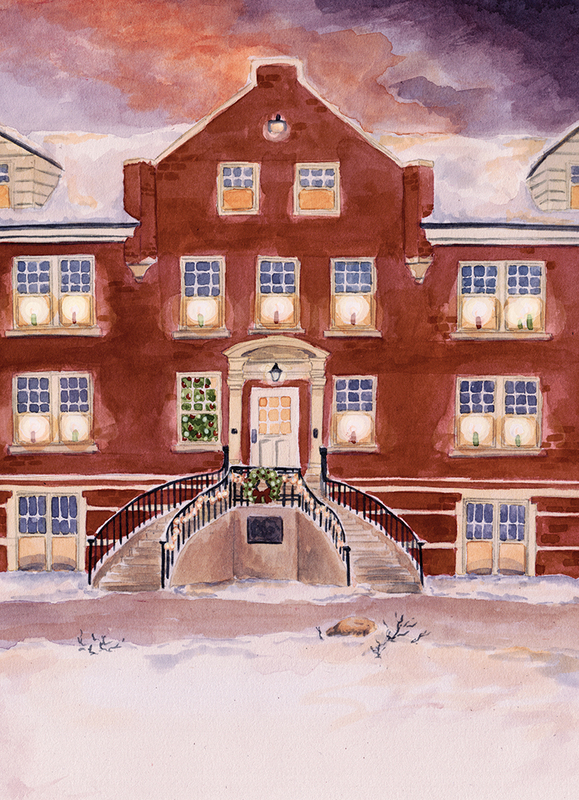 They were looking for a festive, wintry scene featuring the front steps of the building. This is the dorm that I lived in for two years and it’s where I met my best friends, so it certainly has a special place in my heart. I haven’t seen mock-ups for the actual card yet, but I will share it when I receive it. Thanks to Camille for working with me on this! For my fellow HC alums, or for those that simply like the painting, it is available as a print here.